Big remote control (RC) Bulldozer construction trucks are great gifts for all year long and are easy to use, have working headlights/tail lights, and controls for digging, dumping dirt, and other payloads. This truck is big and measures over 1 foot long. Watch the Bulldozer remote control toy video below. Buy this RC construction truck today and it will arrive fully assembled with everything you need, including rechargeable batteries, charger, and wireless transmitter. 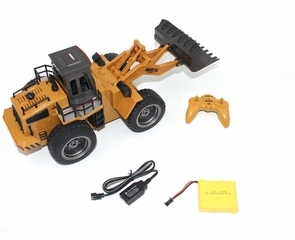 This RC Bulldozer will keep you entertained for hours! Awesome detail including walk around safety rails. RC Bulldozers make a great gift for construction lovers of all ages. Thank you. Birthday this weekend was awesome! Our 5 year old loves his bulldozer! Durable and realistic....he hasn't put it down since he received it for Christmas. I am confident we will be adding to his RC collection in the future from your company. Everything that was stated about this product in the description is accurate. Arrived in secure packaging. Arrived on time is well made and performs exactly as described. My grandson loved it. This is my first purchase with this company and I am very pleased with it. Grandson is having a great time with this bulldozer. All other toys he received are left sitting on the sidelines. This RC Front End loader does everything it says and performs exactly as the video demonstrates. My Grandson loves it and immediately set about cleaning his room with it. Bonus!! A heavy duty remote control front loader bulldozer excavator for a heavy duty kid or adult who loves to play with construction toys. Provides years of entertainment moving dirt or other payloads around.